 From a British specialist in Asian affairs, this is comprehensive, fact-choked history of the Engish East India Company, which went to India to trade and founded an empire--the British Raj. Chosen as one of the three best books of the year in England by the Financial Times, it is a bold attempt to tell the action- packed story of a trading company that was founded in 1600 and continued in business until 1873; a company that, stretching from London to China, was once the world's largest trading power. Over the course of two centuries it behaved more like an independent principality as it made treaties, waged wars, and acquired territories. Created in London by ``men with long heads and deep purposes,'' it originally sought to gain for England a portion of the profitable spice trade, which had been hitherto controlled by the Spanish, Portuguese, and Dutch. There was also a secondary purpose--to find markets for Britain's wool cloth, an absurdist subtext to the more colorful trading ventures as the British merchants vainly tried to sell heavy fustian to tropical peoples. 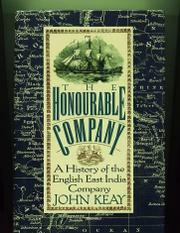 Beginning with the early days when these entrepreneurs were more buccaneers than legitimate traders, Keay goes on to describe the derring-do and occasional chicanery that led to the granting of trading rights; the great fortunes made in India by men such as Thomas Pitt, the great-grandfather of Prime Minister William Pitt; the founding of cities like Calcutta and Bombay; the regulations made in response to attacks by Edmund Burke, who claimed the company had broken every treaty it had ever made and sold every title it had ever dispensed; the opium sales that paid for the entire investment in tea; and the eventual takeover by the British government intent on creating an empire. Keay has written a colorful, swashbuckling saga filled with epic characters and ambitions as corporate history merges with world history. A notable achievement.